In 2018 Tyler Dupree missed only missing four games for the Academy in the season, and gained praise from his coaches for the impact he made in his 22 appearances off the bench. 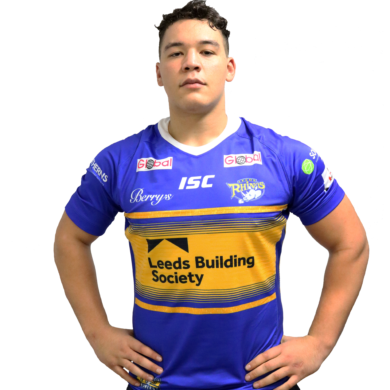 He earned a place in the Rhinos first team squad ahead of the 2019 season and was awarded the number 35 shirt. A former Halifax ERA and Siddal player, he joined the Academy along with some of his former team mates. In 2018 he was part of the Yorkshire side that lost 20-33 to Australia Schoolboys. The second heaviest in the squad behind Tom Holroyd, Dupree has added weight to the Rhinos pack and has brought the tries, with nine throughout the season. Four tries back to back from the round two clash against Bradford to the round five match up with Newcastle. A fan of the Greatest Showman, Dupree’s favourite movie quote is from that film – “‘No one ever made a difference by being like everybody else.” He likes listening to “Active” by Sneako and Giggs and enjoys watching Brooklyn Nine-Nine. He cones from a sporting family and his great uncle also used to play American football in the NFL. If he could have tickets for any sporting event, past or present, it would have been the Anthony Joshua vs Vladimir Klitschko in 2017 at Wembley Stadium.